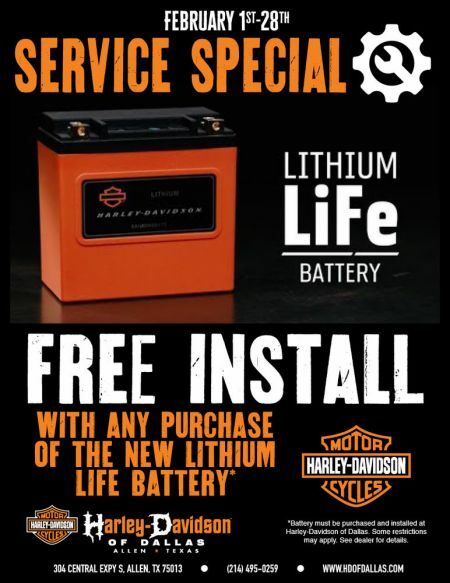 Free install with any purchase of a Lithium LiFe Battery! Now-February 28th, 2019! Want a reliable, long-lasting battery with the best cold-cranking amps available? Now you can have all that along with a significant reduction in battery weight. The Harley-Davidson® Lithium LiFe Batteries offer a long life and more cold-cranking amps than standard H-D® AGM batteries. Compared to AGM batteries, the Lithium LiFe batteries weigh an impressive 17.66 lbs less on Touring models, 12.2 lbs less on Softail® models and, 8.8 lbs less on Sportster® and Harley-Davidson Street® models. The LiFe battery features machined brass terminals for an uncompromised connection and an on-board tester that allows you to instantly see your battery's power level. The LiFe battery uses an impressive 90% of range capacity compared to AGM battery's 10% which provides unequalled cold-cranking amp power to start your bike in even the harshest of conditions. Lithium LiFe batteries have a life that is two times longer than AGM batteries and maintains charge during winter storage (when properly disconnected). Included with each battery is a caddy that insures the LiFe battery fits perfectly into the battery compartment. For optimal charging, use the Dual Mode Battery Tender, sold separately. Some restrictions may apply, please see dealer for complete details.